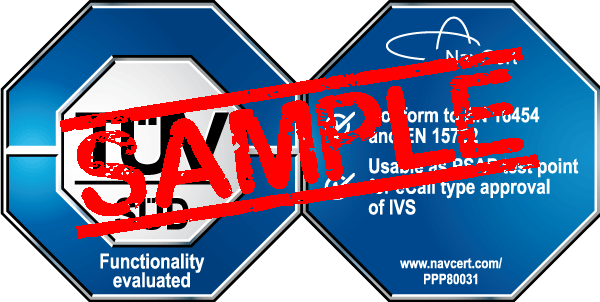 This certification mark is awarded to a PSAP simulator as a dedicated PSAP test point. The PSAP test point offers a platform to process eCalls generated by an IVS. The communication between IVS and PSAP test point may be established locally in a simulated network or via public network. The test point may be used as a dedicated PSAP test point according the Delegated Regulation 2017/79. This certification mark is awarded within the scope of voluntary certification based on test criteria derived from the applicable eCall standards. Conformity with the High Level Application Protocol (HLAP) and the Minimum Set of Data (MSD) is emphasised especially. The continuous adaptation to current standards and the procedures for quality control of the software development process are part of the review process in an audit. Conformity with the applicable test cases of EN16454 chapter 11.4 is validated by means of application testing and audit. By the process of application testing it is validated that the PSAP component reacts correctly to the applicable test cases of EN 16454. The correct implementation of the requirements of the HLAP and MSD standards is validated according to EN15722. Additionally in an audit it is checked, if the development and enhancement of the PSAP test point underlies controlled procedures and methods. This is done according to controlled procedures assuring that the quality of the PSAP test point will be maintained for updated standards or functional improvements. The application test verifies that the test point is a serviceable test environment and can be used as a tool for eCall type approval. The stability of the test point upon receiving incorrect MSDs will be validated. The functionality of the PSAP test point is tested by verifying, that all functions of the system work as advertised and produce the expected result.